Aviation pioneers such as Charles Lindbergh, Amelia Earhart, John Glenn, and Chuck Yeager are well known among the general public, but the name Elrey Jeppesen, AKA “Capt. Jepp,” is familiar only to pilots and those in the aviation community. This book is out to change Capt. Jepp’s anonymity. Capt. Jepp began his flying career as a teenager in Oregon in the “Roaring 20s,” flying war-surplus Jennies as an instructor, stunt pilot, and barnstormer. He then became an aerial photography pilot in Mexico, an air-mail pilot, and a pilot for the fledgling United Air Lines in the 1930s. But his real claim to fame is the system of aerial navigation he devised. Jotting down notes about every airfield into which he flew, he found scores of other pilots wanting his notes—and were willing to pay $10 for them. A sideline business sprang up in his basement—until the demands for his notebook (the “little black book”) became so overwhelming (and profitable) that he was forced to give up his first love—flying. Eventually the company he founded became a multi-million-dollar international enterprise, and today Jeppesen navigation products are used by virtually every pilot and every airline in the world. So important did he become that, in 1990, he was inducted into the National Aviation Hall of Fame and, in 1995, the main terminal of the new Denver International Airport was named in his honor. Capt. 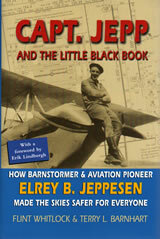 Jepp and the Little Black Book is a fascinating look at the early days of flying and the life of this formerly unsung hero of the skies. A “must-read” for every aviation buff. I have used Jeppesen Aviation Manuals for over a quarter of a century without giving much thought to their heritage. After reading this book I realize Elrey Jeppesen’s sacrifice and monumental effort in creating this system. A must-read for all pilots interested in the history of the precision and safety of aviation navigation that we use every day.